Greetings friends and fellow crafters. LeeAnn here with my February Inspiration post using the mood board. Using the colors of the mood board I went with it and had fun. The background die is from my stash. The flowers were stamped using Memento Dew Drops in Rose Bud and Dandelion, the stem is New Sprout. I stamped the flowers on Canson XL watercolor paper and cut with the Scan N Cut. The flowers and sentiment are from the Loving Mom stamp set. 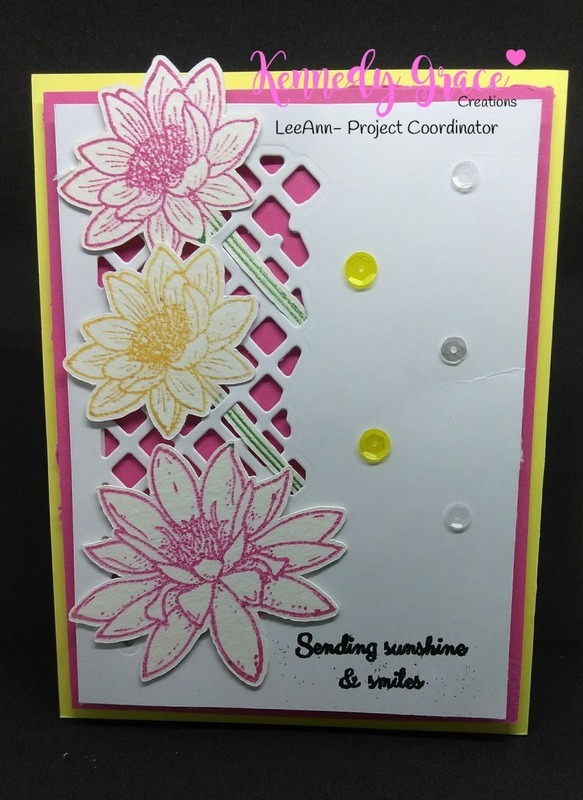 I added a few sequins from the Lemon Sorbet mix and my card was complete. Please be sure to follow the Kennedy Grace Creations blog, facebook, twitter, instagram and pinterest. Our Design Team has great projects to inspire you with our great stamp sets.